I’ll just come out and say it: Internal strength is real. Of course, it looks nothing like what’s in the picture above! Come on now, people! Life isn’t a video game! 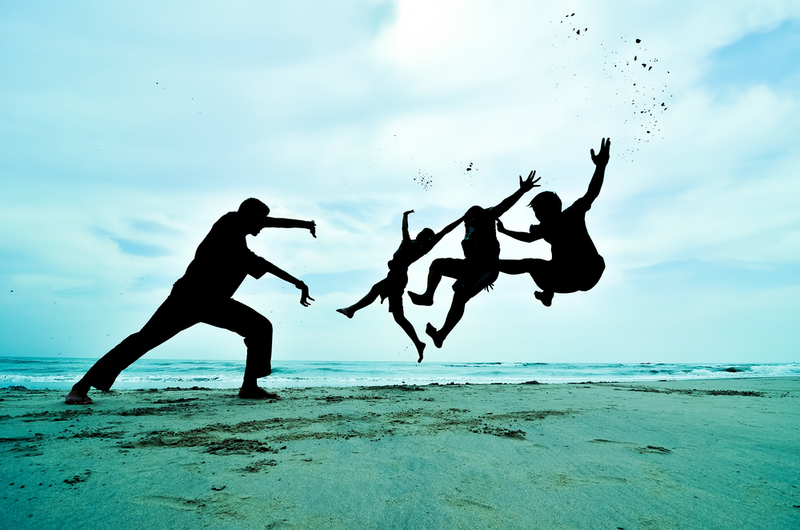 My mission is to help bring Qigong and Tai Chi into the 21st century. This includes helping people to separate fact from fantasy. When it comes to fantasy, there’s nothing like the topic of internal strength (nèi jìn, 內勁) to stir people’s imagination. In an earlier article, I introduced the concept of internal strength. If you haven’t read that article, then I recommend that you do. But relax — you can read this one first. In this article, I’m going to stick to things that I have personally experienced. I’ve heard stories that are far more fantastic than anything I’ll discuss in this article. Although those stories come from people that I trust, I’d like to leave them out of the discussion simply because they are not first-hand accounts. I’ve been cultivating internal strength for over 2 decades. My own experiences give us plenty to talk about without needing to delve into the realm of hearsay. As we move into the 21st century, I think it would be wise for us to stick to things that we have seen or experience personally. This doesn’t mean that you should only believe in things you’ve seen or felt. For example, I personally believe that some feats are possible even though I haven’t witnessed them (yet!). This is the delicate balance of being a healthy skeptic. Investigate things, but remain open minded. So let’s get started. Here are some of the things that I’ve personally experienced. When I practice a Kung Fu form (especially Tai Chi forms), my arms and fingers start to vibrate. The same thing happens when I practice martial qigong exercises like One Finger Zen. I’ll be the first to admit that the phenomenon is a bit odd. It looks as if I’m tensing my arms so hard that they are shaking. But I’m not tensing. The vibration definitely doesn’t come from isometrics. My arms remain soft when this happens. In my Karate days, I learned a famous exercise called Sanchin Kata. I learned different variations from several different teachers. It’s not politically correct for me to say this, but I honestly believe that this kind of training is incorrect — assuming that the goal is to develop internal strength. Why is it incorrect? Because it breaks all of the principles of internal training! Tense muscles and forceful breathing are NOT the way to internal strength. Before I go on, let me be absolutely clear that one can be powerful without internal strength. There are plenty of tough Karateka who have done tons of external training and are incredibly strong and powerful. For years, I’ve thought about how Sanchin Kata probably developed. Here’s my theory. The ancient Okinawan Karate masters originally learned their skills in China. But there was a language barrier as well as a culture barrier between China and Okinawa (an island close to China that now belongs to Japan). The Chinese masters, while demonstrating their Kung Fu skills, probably demonstrated the vibration of internal strength that I described above. And the Okinawan Karate masters, trying to be good students, simply copied the vibration. Because of the language and cultural barriers, the Chinese masters didn’t correct this mistake. It’s also possible that the Chinese masters were doing it wrong. Perhaps they had already been doing it wrongly for many years. We’ll never know. Either way, the problem is the same. If you try to force the vibration, you’ll never develop internal strength. Not ever. Not in 10 years. Not in 100 years. If you tense the muscles and force the breathing, you block the flow of Qi, and thus block the development of internal strength. You can be powerful, but that power won’t come from internal strength. What good is this vibration? Well, I believe it plays a part in Experience #2. I’m not a big guy. I’m not even a medium guy. In boxing, I would be in the welterweight class. Nevertheless, I hit surprisingly hard. I know I hit hard — harder than most people my size. I’m just not sure how I do it! Here’s my theory on why I’m able to hit so hard. First, let’s analyze why a heavyweight boxer hits so hard. If I remember my physics formulas correctly, Force = Mass x Acceleration (F=MA). In other words, heavyweight boxers have more forceful punches because there is more mass (M) behind the punch. But that’s only part of the story. 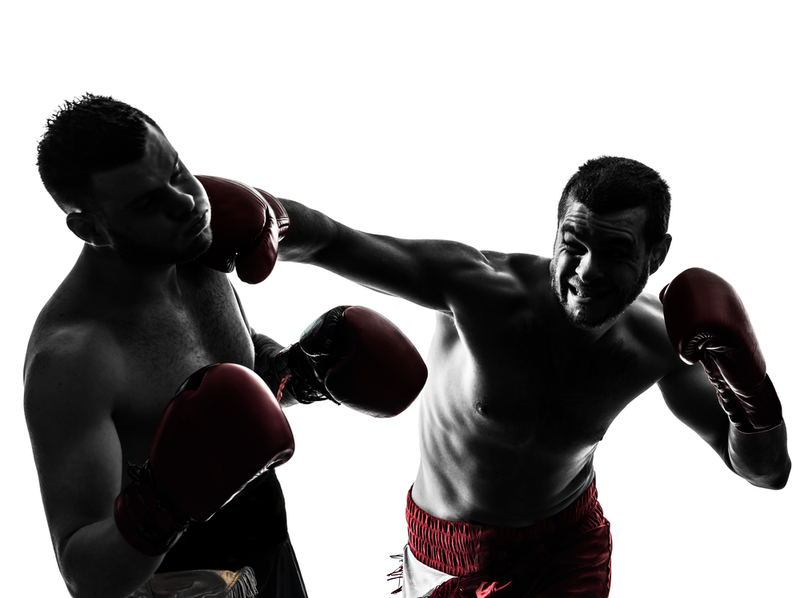 How much mass is delivered via a punch also depends on how connected that punching arm is to the body, and also the ground. By “connected” I mean this: If you don’t have your weight behind your punch, then you’re only punching with the mass of your arm instead of the mass of your body. But punching is not efficient. All punches have “leaks” where power is lost. For example, the fist itself compresses on impact, dissipating some of the power. Similarly, if the puncher’s body “gives” a bit during the punch, more power will be lost. Those of us with internal strength are still bound by the same laws of physics, but our power generation is nonetheless different. Whereas boxing uses tension to create force, I use relaxation. A boxer can only relax so much during a punch or else he (or she) will lose that connection that I talked about earlier. In other words, they need to tense their muscles enough that they are still punching with their entire body, and not just their arm. But with arts like Tai Chi, we learn to connect the arm without tension. We connect the arm to the waist, and then to the legs and the ground — all of this using Qi (or energy). Actually, it’s the other way around — the power comes from the ground, through the waist (or the hips) and then out the arms. But you get the idea. The type of body connection or integration that Tai Chi practitioners can get is downright foreign to those who are used to arts like boxing. We achieve the same effect of connecting the arm to the body as boxers, but without the tension. Because we don’t use tension, we’re also able to punch faster. 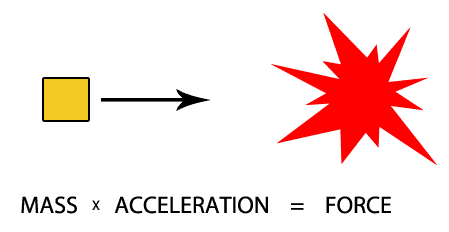 In the physics equation above, don’t forget about the acceleration part. It’s the combination of BOTH mass and speed that creates force. In other words, I hit so hard because I’m more connected, and because I’m using my speed and my mass more efficiently. When I first heard one of my teachers talking about breaking the bottom brick, I thought he was joking. It sounded like something out of a Van Damme movie. As is my way — I decided to test it out. 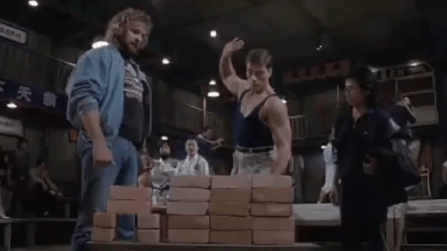 I placed a brick on top of two other bricks, the way I would normally place them if I were going to break a brick (which I had already done in my Karate days). Then I placed another brick on top of the first brick. So there were 2 bricks back-to-back, with no space between them. Then I hit the top brick, trying to break the bottom one. I almost broke my hand. For those who have tried to break bricks, you know that, if you do it wrong, it hurts like hell. This hurt worse than that. Being genetically predisposed to high levels of stubbornness, I did the most natural thing I could think of: I tried again with my other hand. I walked away with two bruised hands, a bruised ego, and a fascination with the challenge of breaking the bottom brick. For about a year, I kept trying on and off. I never succeeded. I broke the top brick a few times. And one time, I broke both bricks. But the bottom brick eluded me. Around the same time, I started practicing an art called Cosmos Palm. So one day, after doing my Cosmos Palm training, I tried to break the bottom brick. Honestly, I expected the usual hand-numbing experience. But this time, something else happened. The bottom brick broke! I thought it was a fluke, or a bad brick. So I tried again. I messed something up, and hurt my hand again. But then, because I’m stubborn, I tried my left. Success again! Note that my classmates, who weren’t able to break the bottom brick, still showed decent breaks nonetheless, especially since none of them do any external conditioning. My best guess is that this has to do with the level of connection that I talked about in Experience #2. My palm is more connected to my body via the Qi. But’s more than this. The Qi also seems to protect my hand, and make it more resilient. It’s not the same as Iron Palm, but there’s definitely a hardening effect. How does it work? I honestly don’t know. But I know that our hands aren’t as solid as we would like to believe. Our hands are made of protons, neutrons, and electrons, spinning and vibrating. And those are made of quarks. What gives things solidity is, in the end, just energy. In part II of this article, I’ll talk more about this “hardening” effect. I’ll also talk about more of my experiences, including some that deal with the emotional and spiritual side of internal strength. If you have comments or theories to add to my own, then please do so in the comments below. I’d love to hear from you! 1) The video was painful to watch. I would not want to practice that way. I’m sure he’s amazing at what he does, but I got tense just imagining how to do that. No thanks! 2) This concepts of relaxation in relation to strength reminds me of the Tao Te Ching. I remember you talking about an article or something called “That was Zen, this is Tao,” but I never got a chance to read it. Did you write that, or was it something else? I’d love to hear more on the topic of the Tao Te Ching and internal force. I’m a no-nonsense kinda guy! when you say something comes up from the ground do you mean jin or earth force or earth chi even? Hi Kevin. I mean “jin”, which means force or strength or power. You can actually feel the power coming up, like a wave, from the legs, through the waist, and out the arms. It feels awesome! Thankyou Sifu Anthony. Yes I have felt this force come up no rare occasions. First The Heaven force comes down and you feel melting sensations. It feels soft and sinky. Then when you get aligned the earth force comes and it feels hard. I think It’s this combination of soft/hard forces that gives your body the elastic but steel like quality. The old taiji masters would spend about 30 mins or however long it look to get these forces to enter them and then do the form whist remaining in that state. Now that is awesome ! Interesting article! It was the experience of internal energy that caused me to join a Tai Chi class this summer, out of curiosity I did a “Chi Ball” Qigong meditation I found on YouTube, and my hands felt just like magnets do when the same poles are repelling each other! That has happened several times since. I’ve always been interested in doing Tai Chi but that just made me want to learn more. Then during my second Tai Chi class my fingers started twitching during Falcon Flapping its Wings Qigong. I thought it was really strange but my teacher said it was the Qi. Anyways, thanks for the great website – very useful info! Thanks for the kind words, Jane. It sounds like you’re very sensitive to Qi. Keep up the good work! Yes, I’d like another article about Internal Strength. 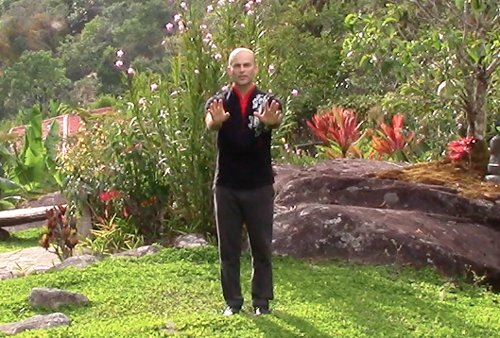 I’ve read various things about what you can do with qi and qigong at higher levels of your training. I’d like to know more especially how it will all feel. Currently I am training in Shaolin Kung Fu and I’ve already noticed the differences it’s having on my body (balance, strength, and confidence). 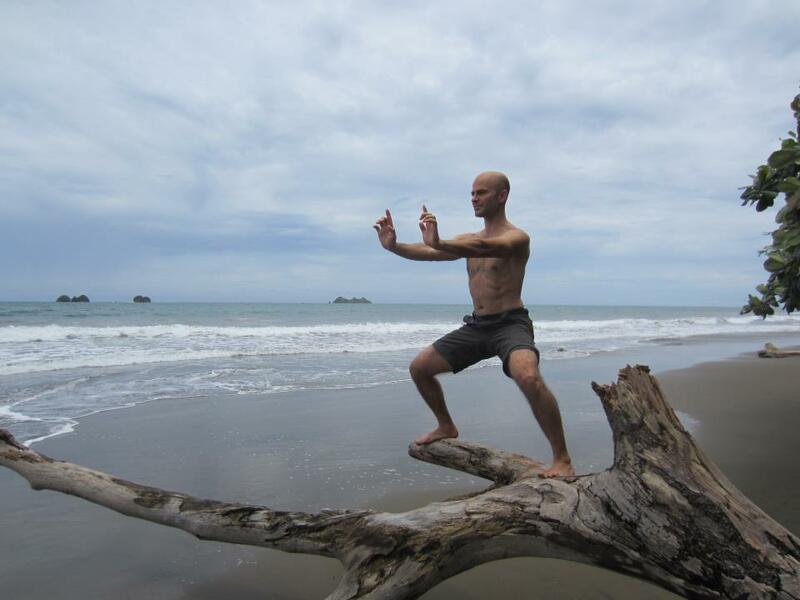 I also feel a difference in my qi in my qigong exercises (which I kinda taught myself through Bruce Francis’ book and Lifting the Sky from this blog!). Honestly, though, some of Bruce’s writing confuses me. I’d like to know how my body will let me know how far I’m going. I once saw videos of a Karate master named Kenji Ushiro. In his style there is no dynamic tension like in the video you posted, but relaxation and the development of ki. claims that this is the real karate that was originally taught or something like that. David, that sounds much more like my own experiences with One Finger Zen. Can you find the video? Jason Scott Lee had a similar gardening experience at the Shaolin Temple. Have you seen that documentary? It’s on YouTube. I’ll look for it. Thanks John! Hi Anthony, I’ve thought about what internal strength could be and this is the best I could think of. Internal strength is the results of Qi entering the fascia, muscles, bones, nerves, blood and marrow and purifies/refines them. After refining these components can now effectively store Qi and produce internal strength. Sounds about right, Freskim. But how does that explain the mechanics of it? How does it explain the manifestation of internal strength? Honestly I have no idea :p.
On second thought, what if the mechanics behind it are close to infusion? For example if you expose material to radiation that material now carries residual radiation particles. So in this case you are infusing multiple parts of your body with your own Qi, and that residual Qi is adding a multiplying effect on mechanical force. I’ve never, personally, come across internal strength feats so if I’m misunderstanding something please let me know.